When it comes to granting wishes, Cinderella’s fairy godmother and Aladdin’s genie have nothing on Nasser Shaheen and his team at Commercial Flooring & Design Service, Inc. – The Flooring Pros of Hilton Head. With 25-plus years of local experience, and over a hundred years of family know-how, owner, Shaheen has gathered some of the finest flooring possibilities imaginable in his unpretentious Hilton Head Island showroom, where the promise of something extraordinary is limited only by the imagination. The Flooring Pros are invested in finding products that look and feel beautiful, along with flooring that meets the functional requirements of their customers. “One product that has captivated the audience is COREtec®,” Shaheen said. “They call it WPC, which stands for waterproof core. Unlike laminate flooring that was made with a laminate top and the middle was paper, this is an extruded composition. You get it wet and it’s not going to swell up and change its physical properties. They have some incredible patterns; tile-looks, wood-looks.” Patented COREtec® construction begins with a cork under-layer that absorbs imperfections in the subfloor, is naturally resistant to mold and mildew, and provides additional sound insulation. On top of that is the COREtec extruded, waterproof layer, followed by the chip- and dent-resistant luxury vinyl layer (where the finished look appears), and finally the 0.5mm-thick wear layer, commercially rated, with exceptional stain resistance and cleanability. Along the spectrum of today’s flooring options, customers will discover the impressive adaptability of these products to meet their design and lifestyle needs. From custom carpet runners fabricated to seamlessly make a tricky turn on unique stair configurations, never missing a pattern-beat, to water resistant carpet that could literally be shaped into a bowl and it would hold water—a pet-owners dream come true. Close your eyes and imagine the floor of your dreams beneath you: fluffy carpet between your toes, a luxurious rug underfoot, smooth hardwood, cool tile…. 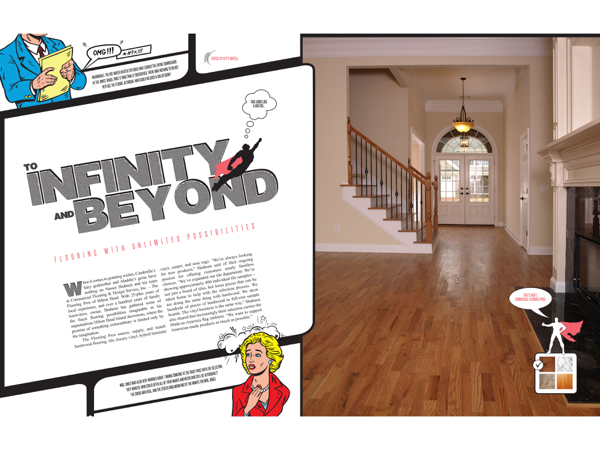 The possibilities are infinite with Nasser Shaheen and The Flooring Pros of Hilton Head. Your wish has been granted. Commercial Flooring & Design Service, Inc. – The Flooring Pros of Hilton Head is located at 90 Beach City Road, Hilton Head Island. For more information, please visit flooringproshiltonhead.com or call (843) 689-3118.